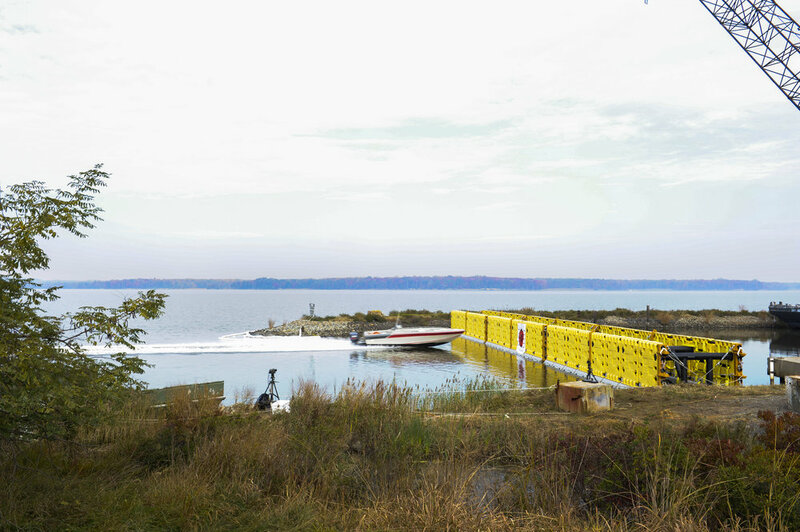 HALO Maritime Defense Systems floating barriers and gates provide essential security to critical assets that are vulnerable to water-borne access. Government, commercial, and private assets on the water have a critical need for protection from intrusion, destruction, or theft. HALO Maritime Defense Systems is uniquely qualified to provide maritime security solutions for the protection of naval bases, naval ships, LNG terminals and tankers, and other vulnerable resources. HALO's innovative security barriers, automatic gates, and waterway access control products are the best solution to your maritime security needs. HALO barrier systems are specifically designed as a complete defensive solution comprised of static components and dynamic retractable gates. The advanced composite design ensures survival in the harshest marine environments with no impact to the local ecosystem. Our barriers are designed to displace high energy impacts and remain intact and ready for potential follow-on attacks. HALO security solutions are the only waterside barrier system on the market to have been rigorously tested by the US Navy with independent verification of the results. Integrated camera systems and detection systems. Anti-swimmer, or anti-diver drop-netting for sub-surface protection. Integrations with third-party security solutions including existing lighting systems, sensors, and audible deterrents. HALO GUARDIAN® and SENTRY® Automatic Retractable Defensive Barrier system with US Navy aircraft carrier HARRY S TRUMAN (CVN 75). We provide complete security solutions with a robust, automated access control system. Our fully automated retractable barrier is the only field-proven, independently tested system available. Patented GUARDIAN® and ORION® retractable barrier systems can fill the spans between breakwaters, buoys, piers, and platforms and provide automated access control at the push of a button. Securely open your HALO gate at any time, in any weather condition. HALO GUARDIAN® Automatic Retractable Defensive Barrier opening. The GUARDIAN RDB operates at the press of a button. HALO ORION® Automatic Retractable Defensive Barrier system. The ORION® RDB operates at the push of a button. Download the HALO® product lineup specification sheet. Hamas preparing Iranian-style swarm boat attack for future clash. Israel Navy's Squadron 916 of fast patrol boats is training for such scenarios, while patrolling Gaza's coast, where Hamas disguises its naval units as fishing boats. London and Kuala Lumpur, 4 May 2017 – Pirates and armed robbers attacked 43 ships and captured 58 seafarers in the first quarter of 2017, slightly more than the same period last year, according to the latest ICC International Maritime Bureau (IMB) piracy report.